We can supply top grade SS marble dry-hanging fittings in high quality with reasonable prices. 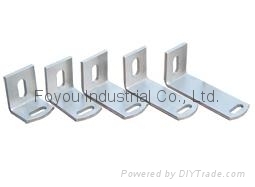 We are specialized in producing various kinds of such dry-hanging hardware. Always, welcome you to provide your designs and drawings, then we can arrange production to meet your requirements. These hanging hardware have been exported to USA, Europe, Middle East, South-eastern countries. Welcome your inquiry, it will be a start for us to provide you best prices, quality products and prompt service!